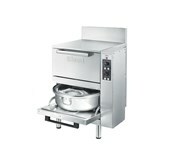 The GES 10 #RollerGrill Waffle iron accepts deep-frozen, frozen precooked waffles or home made fresh batter. 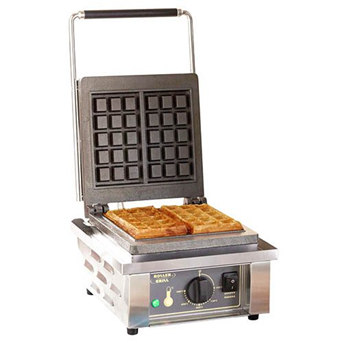 The GES 10 Waffle maker is a Belgian Bruxelles mould featuring 3 x 5 squares (20 x 25 mm). It is equipped with real iron plates. #RollerGrill Waffle Iron GES 10 The highly conductive cast-iron plates spread heat evenly and give golden, crispy waffles in 2'30. #RollerGrill Waffle Iron GES 10 Easy cleaning: a patented removable tray surrounding the bottom plate collects excess dough. #RollerGrill Waffle Iron GES 10 Features: on / off switch, thermostat 0-300 ° C, pilot lights. Drip tray for excess dough. Delivered with a special fork for waffle Belgian waffles.